This is the beginning of a new blog section dedicated to local food tasted around. Let’s see what I have discovered to far in Mexico. Alambre is a popular Mexican dish consisting of grilled beef topped with chopped bacon, bell peppers, onions, cheese, salsa and avocado. 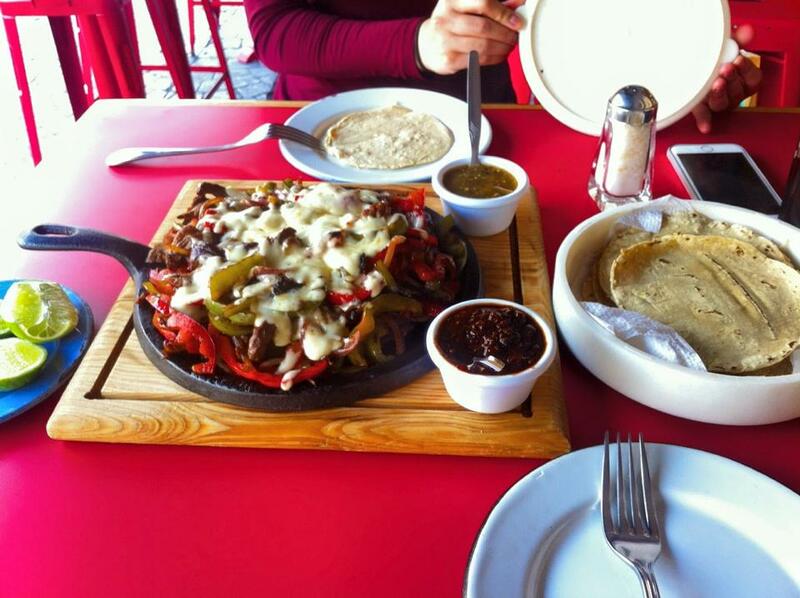 It is usually served with freshly made warm corn or flour tortillas. The most common ingredient is beef, and other kinds of meat such as chicken or pork are also used. Alambres are popular in many parts of Mexico, especially in Mexico City and Oaxaca. L’alambre è un piatto molto popolare in Messico e consiste in carne di vitello o di pollo ricoperto di peperoni, cipolle, formaggio, salsa e avocado e servito su un vassoio di ghisa caldissimo.. Di solito si serve con delle tortiglie calde appena fatte. L’Alambre è molto popolare soprattutto dalle parti di Città del Messico e Oxaca. Very typical street food in Mexico City, and one of the very few vegetarian dishes available in this country, it is possible to find it almost in every corner of the city and tastes delicious. Tostada de Nopales is a crispy tortilla with frijoles, mashed beans, nopales, cactus leaves salad, the almighty coriander, onion, cheese and red or green salsa of your choice. This rocks! 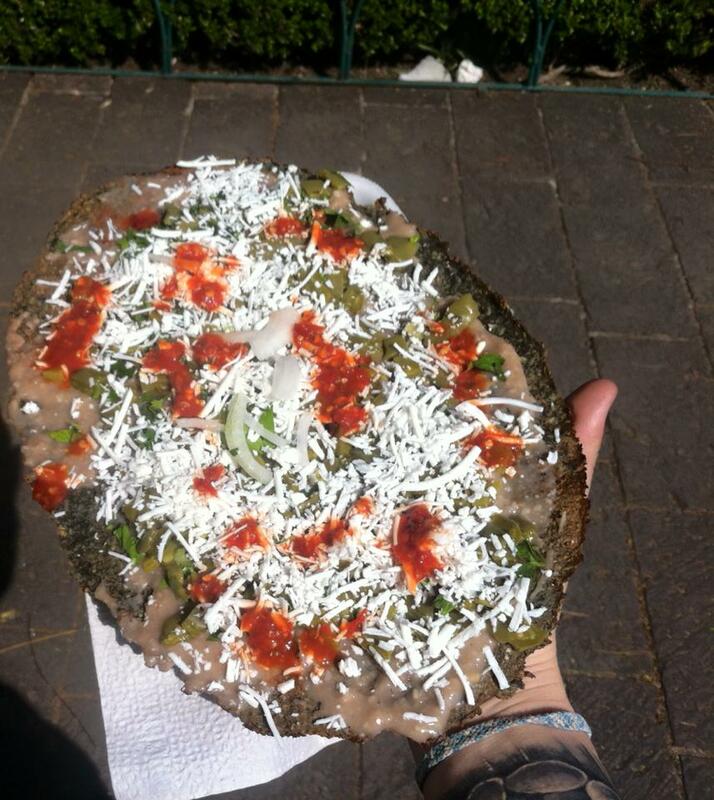 La tostada di foglie di cactus è uno dei pochi piatti vegetariani del Messico e molto popolare tra lo street food del paese. E’ possibile trovarla quasi ovunque negli angoli di paesini e città e consiste in una tortiglia di mais croccante con sopra una salsa di fagioli che si chiama frijoles, insalata di foglie di cactus con cipolle, formaggio, l’immancabile coriandolo, e salsa verde o rossa a scelta. Piccante. Ovvio. Ma questo lo approvo! Era squisito! This is the weirdest of all. 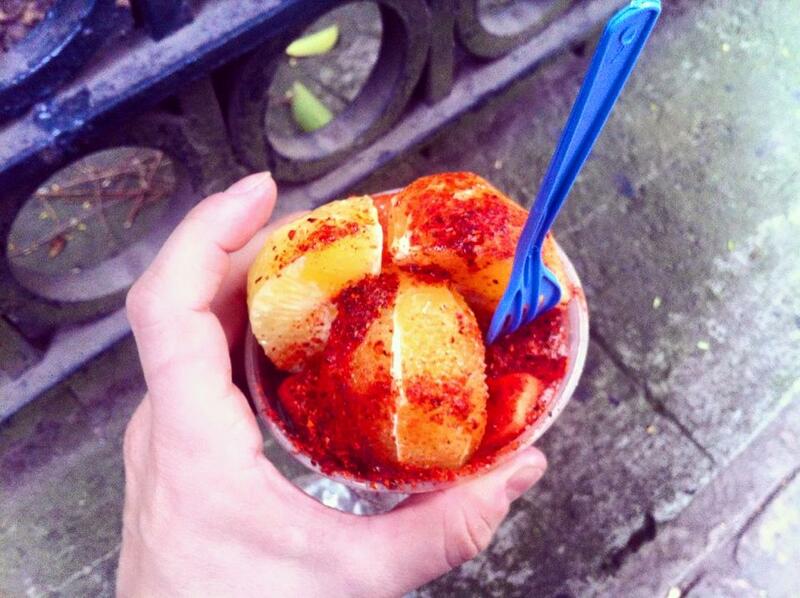 Mexicans are obsessed with picante, spice chilly powder or salsa and put it on everything, from kids’ candies to fruit. Yes, you heard it right. It is very common, or maybe just normal here to eat fruit with chilly powder on top of it. Not that it is not good, I actually loved it on oranges, but it is definitely one of the weirdest thing sever seen around the world. Ed eccola la cosa più strana vista ed assaggiata finora per le strade del Messico, la frutta con il piccante sopra. I messicani mettono il piccante ovunque, persino nelle caramelle dei bambini, quindi sulla frutta viene di conseguenza. Non che non sia buona, anzi , sulle arance a me è piaciuto moltissimo, ma sicuramente resta una delle scelte più azzardate che si possano fare quando si sceglie lo street food messicano.